India turned things around with a 203-run win in the third Test of; what to expect now, of the fourth, at The Ageas Bowl? 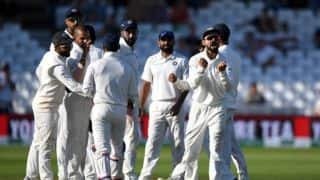 India were supposed to battle hard after the hard-nosed battle in the first Test against England, at Edgbaston. They chose to sink without a trace in the second, at Lord’s. After Lord’s, Virat Kohli‘s men were supposed to be obliterated at Trent Bridge. Instead, they turned things around with a 203-run win in the third Test of the five-match series. What to expect now, of the fourth, at the The Ageas Bowl? Ravichandran Ashwin‘s groin had bothered him at Trent Bridge. There is no news — yet — of his availability for the Ageas Bowl Test. If Ashwin indeed plays, this may be the first time in his stint as Indian captain that Virat Kohli will field an unchanged XI for consecutive Tests. If not, Ravindra Jadeja will be the obvious replacement, with Kuldeep Yadav back home. 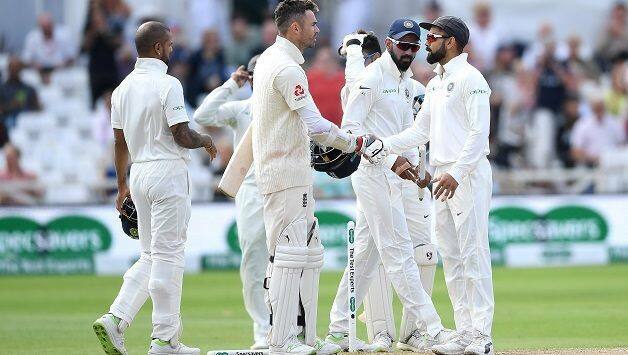 All five Indian batsmen delivered at Trent Bridge (in other words, Kohli found supports from his teammates at the top). 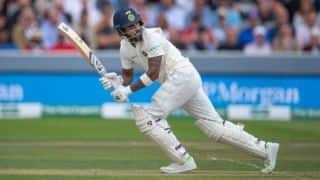 Cheteshwar Pujara got stuck, but hung around to make it count; Ajinkya Rahane played an excellent hand in the first innings; and Shikhar Dhawan and KL Rahul provided India with a start in each innings, something they had missed at both Edgbaston and Lord’s. Additionally, Rishabh Pant was exciting with bat and competent behind the stumps; Hardik Pandya had an excellent match; and the pace brigade seems to have fallen into place despite the absence of Bhuvneshwar Kumar. Ishant Sharma‘s Sussex stint has definitely helped his length. Jasprit Bumrah looked just as incisive as he did in South Africa. Mohammed Shami looked the least destructive of the three, but he is definitely India’s best bet with the old ball. Jonny Bairstow may not like the fact that Shami has promised to target the former’s injured finger. India likely XI for fourth Test: Shikhar Dhawan, KL Rahul, Cheteshwar Pujara, Virat Kohli (c), Ajinkya Rahane, Rishabh Pant (wk), Hardik Pandya, Ravichandran Ashwin/Ravindra Jadeja, Mohammed Shami, Ishant Sharma, Jasprit Bumrah. One of England’s major problems in the build-up for the series was to find a partner for Alastair Cook. In the first three Tests, Cook himself turned out to be a problem. From eight Tests this year, Cook has scored 269 runs at a sub-par 19.21 with a solitary fifty. The current series may be his last shot at a place in the line-up. To make things worse, Joe Root has not been among runs either. England have announced their XI, leaving out Ollie Pope. The team makes intriguing reading. An injured Bairstow is in, though Jos Buttler is likelier to keep wickets. Chris Woakes has been ruled out, and Sam Curran is almost a like-to-like replacement. The problem is with Ben Stokes, who looked rusty with ball at Trent Bridge. To make up for that England have replaced Pope with Moeen Ali, who has a double-hundred and a six-wicket haul under his belt. This means that an injured Bairstow, Buttler, Stokes, and Moeen will be England’s four, five, and six. England XI for fourth Test: Alastair Cook, Keaton Jennings, Joe Root (c), Jonny Bairstow, Jos Buttler (wk), Ben Stokes, Moeen Ali, Sam Curran, Adil Rashid, Stuart Broad, James Anderson. Prediction: India may have come back at brilliantly at Trent Bridge, but there is little doubt that England have been the better side in the series. They have teething problems, with both Bairstow and Woakes nursing injuries, and a top order that refuses to deliver. Having said that, their pace attack is superior under the conditions; and if Stokes, Moeen, and Curran are all picked, their batting line-up will have a near-bottomless look about themselves. The momentum is with India, but England will probably take field as slight favourites despite Kohli. India vs England, Southampton Test: A week later, tables have turned and how!